I have pleasure in sending this invitation on to you. I was fortunate enough to meet Judith during the first Canadian Felt:Feutre conference earlier this year and saw her glorious work exhibited at the show there and knew she would be a wonderful teacher for a Kreative Momentum Workshops. I hope you will take advantage of her visiting us in Calgary. Do get in touch if you have questions or want more information. 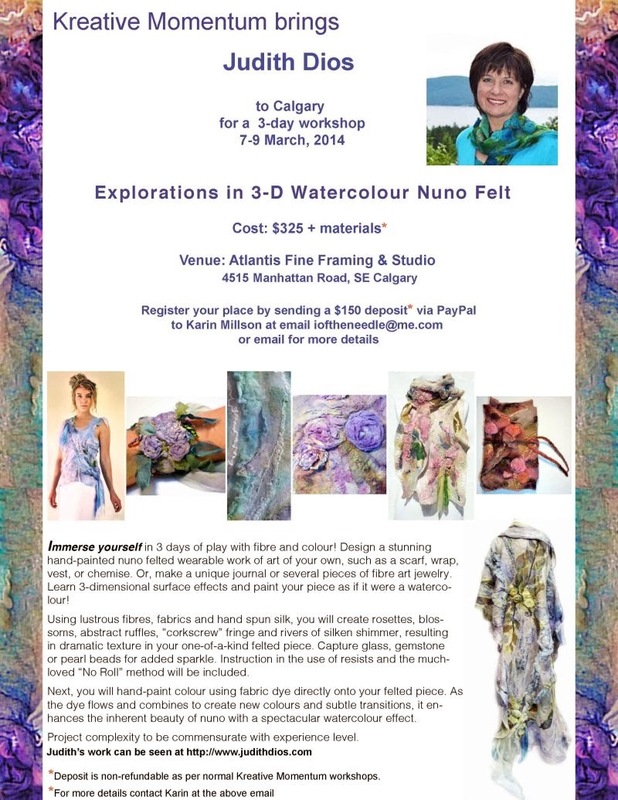 This is a great opportunity for beginner and advanced felters to learn more about Nuno felting, acid dyes, creating felted, sculptural clothing or other beautifully decorated surfaces. Also her method opens up the technique of felting to those with back and upper body aches - get in touch for more information, but I don't want to give the game away to everyone! Judith says “The workshop will work for all levels of experience though some knowledge of the materials and basic method of felting is required for more complex clothing projects." PS I will be at the November meeting of SDA at Atlantis Fine Framing and Studio on Wednesday 20th November, from 6:30. and could take deposits by cheque then, if you wish.